I work with a lot of women’s health issues, and it seems like the most common words out of my mouth are “ground flaxseeds.” It is commonly known that flax is a source of omega-3 fatty acids, particularly alpha linolenic acid (ALA). These healthy fats offer benefits to both men and women because they help fight the inflammation associated with conditions such as osteoarthritis and asthma. The body has enzymes that can convert alpha linolenic acid to eicosapentaenoic acid (EPA), the omega-3 fatty acid found in fish oil. This enzyme can be less active in some people due to genetic variations, diabetes, or by high consumption of saturated fat or alcohol. Because of these potential enzyme problems, many practitioners are suggesting patients use fish oil. But I still frequently recommend flaxseeds because they offer other benefits in addition to those from the omega-3 fats. 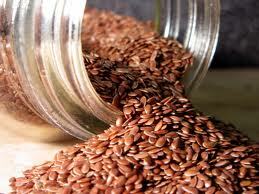 I frequently suggest flaxseeds to women of all ages because they can help restore hormonal balance. In younger women, they may help fertility. For peri-menopausal women they may ease symptoms like irregular cycles, heavy bleeding, headaches, sleep difficulties, fluid retention, and mood swings. Also taking several tablespoons of ground flaxseeds daily may help reduce the frequency of hot flashes. Flaxseeds offer all of these benefits because they contain lignans, compound that are converted to a weak estrogen-like substances. Unlike actual estrogen, these lignans derivatives have been shown to be actually protective against breast cancer. I have only scraped the surface of flax’s benefits. It can also help the heart by contributing to lower blood pressure and cholesterol. Diets high in omega-3 essential fatty acids have been shown to reduce the bone loss associated with osteoporosis. Flaxseeds are also a good source of fiber, which we don’t tend to get enough of in our diets. The nutrients in flaxseeds are much more available when they are ground. Try taking 2-4 tablespoons of ground flaxseeds daily either mixed in water or added to foods like salad or yogurt. Make sure to keep ground flaxseeds refrigerated and start with the lower amount because sometimes a quick increase in fiber can cause digestive distress. For another way to try flaxseeds, here is a recipe from World’s Healthiest Foods for a High Energy Breakfast Shake. I had no idea flaxseeds helped women in this way. I am hoping that flaxseed oil has the same benefit? Look for a flax oil that says High Lignan. I still prefer the ground flaxseeds for the additional fiber. Brown flaxseeds are higher in lignan than the golden one.